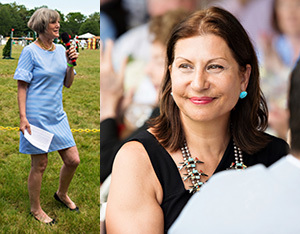 The $30,000 Fairfield Grand Prix was the highlight for guests attending the EQUUS Foundation Benefit Luncheon on Saturday, June 24th at the Fairfield County Hunt Club in Westport, Connecticut. 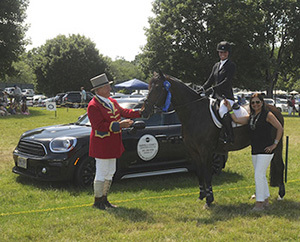 With champagne in hand, guests were treated to a bountiful buffet of delectables prepared by award-winning chef and "Chopped Judge" Sue Torres, the Club's Executive Chef, and enjoyed a beautiful day and exciting show jumping competition. 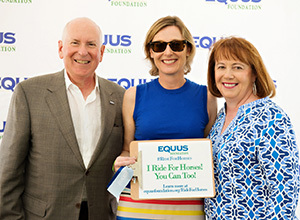 EQUUS Foundation President Lynn Coakley welcomed guests, thanking the Club leadership and staff for its continued support and recognizing the show co-chairs, Benedicte Berg, Wynatte Chu, and Sean Hogan, and EQUUS Foundation Board members, Jenny Belknap Kees, Chair, Catherine Herman, Vice Chair, Jane Henderson, Secretary-Treasurer, along with Directors, Patty Keenan, Dr. Rick Mitchell, and Anne Walker. 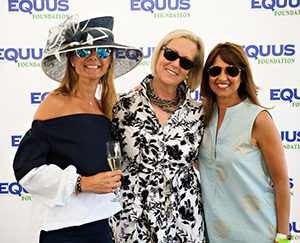 "We are so happy we had a full house of wonderful guests again this year who turned out to enjoy the exciting equestrian competition, delicious summer fare, and best of all, to support our cause of keeping America's at-risk horses safe and loved," said Valerie Angeli, EQUUS Foundation VP Communications. 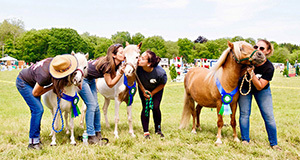 "It is so easy to think that all horses are cared for and cherished like the beautiful horses people see at horse shows like Fairfield - but the truth is, behind the scenes, many thousands of horses across the country suffer neglect, abandonment, abuse and slaughter when they simply become unlucky due to no fault of their own. These powerful yet fragile, sensitive animals give us their all and this gathering was a day to give back to them." 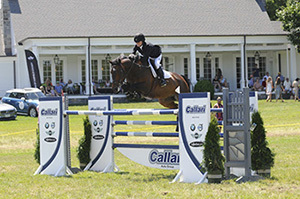 "We all thought with the downpour on Saturday morning that the Grand Prix would move to the sand ring – but the sun broke through just in time. 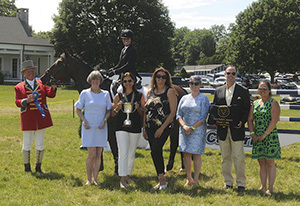 We are grateful to the show management led by William Aguirre, the Grand Prix competitors, the show co-chairs Benedicte Berg, Wynatte Chu and Sean Hogan, and the Fairfield County Hunt Club for making this happen," said EQUUS Foundation President Lynn Coakley.